Hello everyone! I'd like to thank you all in advance for whatever help you can offer me. I'm completely new to planning a garden and I'm a little overwhelmed with my awkward lot. I live in Zone 5, by the way. I moved to my home 2 years ago and I am more than ready to start landscaping my rather awkward corner lot. However, I seem to have absolutely no talent when it comes to planning out a garden. The previous owners seemed to love green. So much so that my house is literally covered in it! I have vines all over my house, which I've grown to like, as well as shrubs everywhere. I'm more the type that prefers flowering plants and deciduous trees instead of evergreens. So step 1 for me is clearing out some of the shrubs. But then what? These are the shrubs lining part of the front of my house. The line of shrubs continues all the way around the side and to the back. My mother has been pushing me to not remove them, as they're mature plants and she thinks the neighbors might miss them, but I have a hard time managing them. I can't quite reach the tops of the trees on my ladder, so most have overgrown areas sticking out, and they look so...I guess plain, to me. I'd like to remove them and put in flowers, (small) flowering bushes and perhaps a flowering almond tree at the far end as well as some decorative greenery like grasses and leafy plants. This is one corner of my house. As you can see, one tree is in horrible shape and the others are overgrown. I'd like to replace these with just a short (maybe 6-8') tree of some sort and maybe a few flowers. This spot gets a little more sunlight than the front, but not much. Any suggestions? This is just to show how much room I have to work with. From the edge of these shrubs to the sidewalk is only about 12-15'. We're going to be fencing in our lot (which does stretch wider near the corner in a triangle shape), so that also needs to be taken into consideration. The fence can go practically right up to the sidewalk so we won't lose too much space. 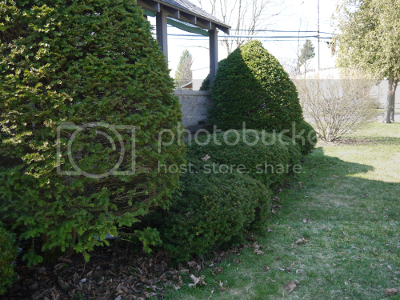 In all, there are probably around 40 or 50 individual shrubs surrounding my home. Around 15 or so are melded together into a sort of privacy wall, but the rest are free-standing. I'm only working on the front of the house for now, since I'm trying to start small, so I would really appreciate any suggestions regarding plants that grow well in that front area and that also are a little easier for a beginner to manage. 1) What plants would work well in that shaded area? 2) Any advice on planting flowers up against the house? Edit - Not sure why links showed up instead of actual images, but if you copy + paste the links then you should be able to get to them. Sorry! Edit #2 - Thank you, Rainbowgardener, for showing me how to get the pictures to show. Last edited by Honeydew on Thu Mar 22, 2012 7:11 pm, edited 1 time in total. In photobucket, all you have to do is click on the IMG code which copies it, then paste it in here. You don't need to use our Img button, because photobucket already provides all that coding. There's a lot of questions in there. I'm just going to start with a few suggestions of flowering shrubs that would like your shady spot: carolina allspice, hydrangeas, azalea/ rhododendron/mountain laurel, viburnum. The azalea/rhodie/mountain laurel (kalmia) are all related flowering, broad leaf evergreens and all need acid soil. The viburnum is a gorgeous native decidous shrub, with incredibly fragrant flowers in the spring followed by berries that birds like and then fall foliage colors. There are a number of hybrid varieties in a range of sizes from quite dwarf to quite large. I personally do not love the look of trimmed shrubbery, especially LOTS of it and I think taking care of it and keeping that much shrubbery looking neat and trimmed would be practically a full time job. Go for it - rip some of that out and put in something prettier. At my house I ripped out a big old evergreen shrub like some of yours and planted a weigela. It is a gorgeous spring flowering shrub, but I think wouldn't like how shady your area is. 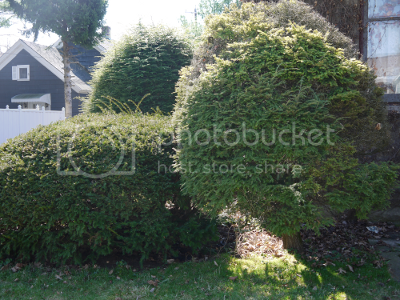 Large shrubs like that can hide people who are up to no good. It's your lot, your house so why worry about what the neighbors think if they are not on the property line. The problem with keeping the shrubs and adding perennials it that they will look out of place. Start on one area first, remove the old fashioned landscaping, to see about the look. A Franklinia, redbud or dogwood might be a good small three at the corner. Mix up decidous with small evergreen or dwarfs. Then in front plant some perennials and bulbs in the fall and see if you like the look but give it a few years. some plants to look at are cotonesater, potentilla and dwarfs. Butterfly bush will get real tall so not plant in front of the window. Remember vines climbing on the house will eventually damage the siding. Thank you so much for the suggestions so far! I'll definitely start looking into the plants you've recommended and see what strikes my fancy. @ bullthistle - I'm not worried about the vines, as my house is made of man-made stone blocks. The vines have clearly been here a very long time and there are no signs of damage. We are careful to inspect the walls, though, when we trim the vines throughout the year. @rainbowgardener - Yes, trying to keep these shrubs trimmed is a full time job. It's part of the reason they need to go. I just can't keep up with them! I had been looking at hydrangeas as a possible flower for the front, but I wasn't sure if they would be able to thrive there. I'm quite happy to see you've suggested them! I have another question: Are there any special rules to follow when planting against a house? Technically that's the front porch, but it's the same thing, really. The house and porch are all those man-made stone (or is it concrete?) blocks. I'm not worried about damage to the porch, but are there any rules about keeping plants a certain distance away or not putting mulch near the wall? And that leads to another question. What types of mulch would work well? I'm not a big fan of mulch, especially wood chips since I don't like the look or the mess that it ends up creating, but I also don't want to have tons of weeds invading the bed(s). I've seen some people put pebbles/stones down. Is that a reasonable option? Is there a way to discourage weeds without mulch (or chemicals, since I have small children and dogs)? Thanks for the advice, Marlingardener! Are there any alternatives to mulch? I hope I'm not being too picky or asking too much, but I'd like to try to avoid mulch if possible. If there aren't really any viable alternatives, I'll just have to accept my fate and get used to the idea of wood chips in my flower beds. What is it about mulch that you don't like? Left bare, you will need to be diligent about weeding. An alternative would be a closely growing ground cover plants that are vigorous enough to prevent most weeds from taking root but will not overwhelm other plants in the same bed. Well I've heard neighbors complain of dark mold/fungus that ends up growing on their house due to the mulch in their beds, so that's a bit of a concern for me. I also have two dogs and one of them like to chew on just about everything she can find. I wouldn't want her to think that wood chips are a tasty new treat. As you have said, applestar, I would have to be very diligent about weeding if I leave the beds bare and I hope to avoid that. I'll just have to weigh my options and decide what will work for us.